All over the world, headlines would be written about Ryan Giggs getting a late winner for Manchester United in his 900th appearance for the club. Let’s rewind a bit to the start of the game and it sure did bring back some memories of meetings in the early years of the Premier League between the two clubs when Norwich City were one of United’s closest challenger for the title in the inaugral year of the English Premier League. The season was 1992-93 and Ryan Giggs ended the season with his first ever Premier League winners medal around his neck as well as the PFA Young Player of The Year award. 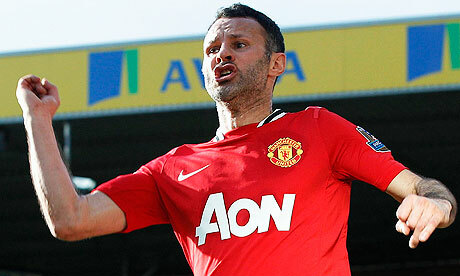 Now fast forward to 2012 and Ryan Giggs steps onto the Carrow Road field with shorter, greying hair and a grey beard to make his 900th appearance for one club in the position where he made his name, left wing. It was perhaps fitting that he had the last word and celebrated it with such gusto with his team-mates and fans like as if that was his first ever goal he has scored for United. If you didn’t catch the game and was wondering how was the performance from United, I would just say that it wasn’t the best, most free-flowing football we have seen United play this season. United started very well and another golden oldie, Paul Scholes rolled back the clock to sneak in behind his younger team-mates, Danny Welbeck and Javier Hernandez to get on the end of a Nani cross to plant the simplest of headers from just few yards out with Norwich’s John Ruddy beaten. We did have some good interplay in the final third to create some chances and tear open Norwich’s defence almost at will but slowly, the home side’s exuberance and verve took control of the game and applied more of themselves and pressure on the Red Devils. United carried on passing at one speed without increasing the tempo and the passing grew sloppy as passes keep getting misplaced and the first touches were letting the players down. United had our very own Spanish Cat, David De Gea to thank as he made three splendid and crucial saves to keep Norwich out but he could do nothing when the much-travelled, Grant Holt turned and shot into the top corner in the 83rd minute. Almost immediately, United upped its tempo and pressure and created a few clear cut chances notably two missed by Welbeck from good positions. Whenever United went forward with the increase in intensity, it looked likely that we could create another chance as we mounted relentless pressure on Norwich’s goal. The script was then set and made picture perfect when substitute Ashley Young’s cross was met by none other than the man of the day, Giggs to delicately place in the back of the net and run off celebrating like a mad man. At the end of the day, it’s another 3 points in the bag and we are still one win away from replacing Manchester City on top of the table. However, the performance in large parts was lacking in speed and intensity. We showed that whenever we went forwards we could fashion out a chance at goal but we didn’t do it too much. Our play and passing got sloppy and the players weren’t moving fast enough. It was almost like the players were just playing within themselves and were more content with knocking the ball about sideways and keeping possession rather than passing it about with more intensity forwards and towards goal. At half time judging from Sir Alex Ferguson’s body language, one might understand that the boys were in for the hairdryer treatment from the manager and an improved performance in the second half was beckoning but that was not forthcoming until we were pegged back. It is in the United DNA to score late goals and believe until the last moment but we almost paid a heavy price for a rather lacklustre performance. Very nearly it became a little too late to pick up the pace and intensity especially when glorious chances were being missed by Welbeck. Thankfully, we got out of jail again. Yes we cannot win by playing brilliantly all the time but we got to start playing better consistently especially now at the most crucial period of the season. If we don’t do it now, when would we want to do it? Once again it felt like complacency got the better of the players which is again a worrying trend. Nani and Hernandez certainly need more games to re-discover their respective forms. Phil Jones had a solid game defensively but still you are left feeling that this is not the Jones that caught our eye and excited us with his early season performances. It’s great to have Young back and he had a decent cameo performance but he too needs more game time. The veterans, Giggs and Scholes are still relied on heavily to get us wins. At the back Rio Ferdinand and Jonny Evans are forming a good partnership. De Gea is in his strongest form ever since his move to United and it is showing on him and we do hope that he has more to give. He has to, he is only 20 after all. With the international break around the corner in midweek, we would keep our fingers crossed that there are no more injury problems and those that are injured and missing are able to return over the international period. We have a tough away encounter against Tottenham Hotspurs next and they would be wounded having been trashed by arch-rivals and neighbours Arsenal today. It is not going to get easy for us at all. Previous Midfield Conundrum : What Led To All This? Next Berbatov as playmaker : Possible or pointless?